Crescent rolls had been around for centuries before the Pillsbury Doughboy, aka “Poppin’ Fresh,” made his spectacular debut: on Sunday, November 7, 1965, he popped out of a can of refrigerated crescent rolls and onto televisions across America. 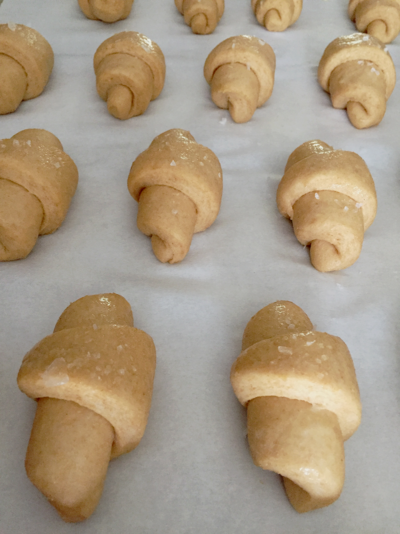 Crescent rolls are legendary—literally. Among the many origin stories: in antiquity, they were religious offerings to the moon goddess or the bull god; they represent goat horns and therefore Pan, the over-sexed (horny) flute-playing, half-goat, half-man god; they symbolize drinking horns and therefore Bacchus, the god of wine; they are the rays of the sun. Or this: because the dough is cut into triangles, the rolls represent the Christian Holy Trinity. In 1938, Larousse gastronomique tied the beginnings of modern crescent rolls to the Turkish attack on Budapest in 1686. Ten years later, Larousse changed the story and the venue to the Turkish siege of Vienna in 1683. Supposedly an alert baker, the only one up in the middle of the night, heard the Turks trying to tunnel under the city walls. Because evidently, when your city is under siege you send the entire army to bed without one sentry and just look forward to fresh bread in the morning. In both cases, the rolls represented victory over the Turks, whose flag is the crescent moon. If that doesn’t work for you, there’s the one about how Marie Antoinette brought crescent rolls to France. 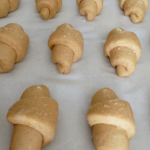 What we do know is that crescent rolls—soft, bready ones—originated in Vienna as kipfel. According to food historian Jim Chevallier, kipfel were popularized in Paris beginning in the mid-19th century at August Zang’s Boulangerie Viennoise—Viennese Bakery, along with other pastries. Which is why in France, certain pastries are still called viennoiserie. Paris went crazy for kipfel. And not just Paris. An American cookbook from the 1870s has recipes for Vienna Rolls, Vienna Saltz-Kipfel, Vienna Twist Rolls, Vienna Butter Rolls (Butter Strizl), and Vienna Crescents, or Kipfel, all made from the same wheat dough, enriched with milk and fat. At that time, lard. In France at the beginning of the 20th century, crescent rolls bifurcated. A new version, made with puff pastry, was crisp and flaky. It became the croissant—which is just French for “crescent.” Croissants did not become popular in America until twenty years after Audrey Hepburn consumed one she held in her black-gloved hand while standing in front of the window in the famous opening scene from Breakfast at Tiffany’s in 1961. It wasn’t until 1981 that Sara Lee rolled out frozen croissants, which instantly became their most successful product. But the original type of soft, fluffy crescent roll, made with milk and butter and with a bit of sugar added, became a staple in homes and restaurants across America in the 19th century. It was also versatile and lent itself to many shapes. 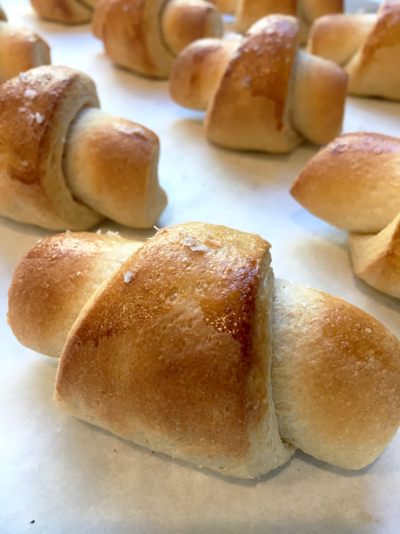 In his recipe for Parker House rolls, James Beard said that the sweet, buttery, milky dough could also be used for crescent rolls because it is “pliable and pleasant to work with.” Truth. Please enjoy this Thanksgiving must-have, from Nan Kohler’s kitchen to yours. With this recipe post, I am sharing some of my childhood nostalgia with you. I have no idea what church cookbook or local newspaper my mom may have clipped it from, but Linda is right. When I was growing up no holiday meal would have been complete without my mom’s buttermilk rolls on the table. When I moved away and began my own holiday meal traditions, those who know me are very well aware that I like to shake things up and rarely repeat the same menu. These rolls have been and always will be the exception. Just one of those things, right? The one cherished piece of home that you can never let go. As with most things, it’s always a bit traumatic to meddle with a favorite sensory memory. However, it became important to me that this recipe reflects who I am today and how I bake, which means swapping out that white refined flour for Grist & Toll whole grain. It didn’t take much tweaking really, just reducing the flour quantity and upping the butter a little (not necessary but SO good). It hasn’t officially passed the mom test yet, but I’m not worried. Wishing you and yours a wonderful Thanksgiving. Special Note: the yield looks large, but I promise the dough bulk is not extreme and unmanageable. The actual size of each roll is not large. I am giving you the original quantity because that’s what I’ve always made, knowing there tend to be more people seated at the table for a holiday meal plus the fact that guests always request a take-away package with rolls. AND then there’s that treasured, anticipated snack of a buttermilk roll with leftover turkey happening multiple times in the following days. *If you’d like to cut this recipe in half, measure out the egg using grams or ounces: 3 large eggs weigh roughly 150g or 5 oz, so you would need 75g or 2.5 oz for a half recipe. I myself would probably use 2 large eggs to make it easy and sprinkle in a little extra flour if the dough felt too sticky. **This recipe was developed for Grist &Toll flour, other brands may not have the same results. Dissolve yeast in 1/2 cup warm water with 1 teaspoon sugar until bubbly. In a large bowl, measure out both flours and mix to combine. In the bowl of a stand mixer fitted with the paddle attachment, combine melted butter, buttermilk, eggs, 3/4 cup sugar, and salt. Mix together then add yeast mixture. Add 2 cups flour and baking soda. Mix. Add the remaining flour one cup at a time. Once you’ve added enough additional flour that the dough is too thick for the paddle attachment (somewhere between 5-6 cups), switch to the dough hook attachment. *Depending on the current grain crop and moisture percentages in the wheat, you may not need to add all 9 cups of flour. Stop after adding the 8th cup. If the dough is still a little sticky, but almost cleaning the bowl, do not add the final remaining cup of flour. Once all the flour you need has been added, mix on medium low speed for 5 minutes. Dough should clean the sides of the bowl, but still be on the soft and sticky side. It’s okay for traces of dough to stick to the bowl, you just don’t want the dough to be too wet and sloppy. Remember whole grains drink in liquids a little more slowly. Once the dough rests, it will be very supple and easy to work with. Transfer dough to a large bowl prepped with nonstick spray or butter or olive oil. Cover with plastic wrap and rest until doubled in size, about 1 hour. Turn dough out onto a work surface. Do not dust with additional flour; you will need some tension for the dough to roll out easily. Divide into 4 equal pieces. Shape into balls, keeping remaining dough balls covered while working. Roll each into a 13” circle. 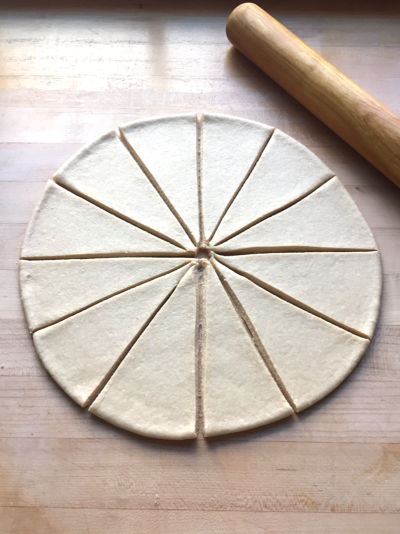 Using a knife, cut into 12 equal triangles. Roll up each triangle and pinch tips to seal. Place on parchment lined baking sheet with pinched seam on the bottom. Repeat. 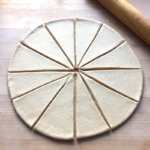 *Optional: before cutting and rolling, brush the circle of dough with softened butter and sprinkle with chopped herbs and/or grated Parmigiano cheese. Cover with a lint-free towel or plastic wrap sprayed with nonstick spray and let rise until puffed but not quite doubled in size, 30-45 minutes. Preheat oven to 375. Brush each roll with egg wash and sprinkle with flaky sea salt. Bake until golden, about 8 minutes. *Egg wash will make the rolls brown a little more. If you want them to look more blonde, don’t brush with egg or butter.